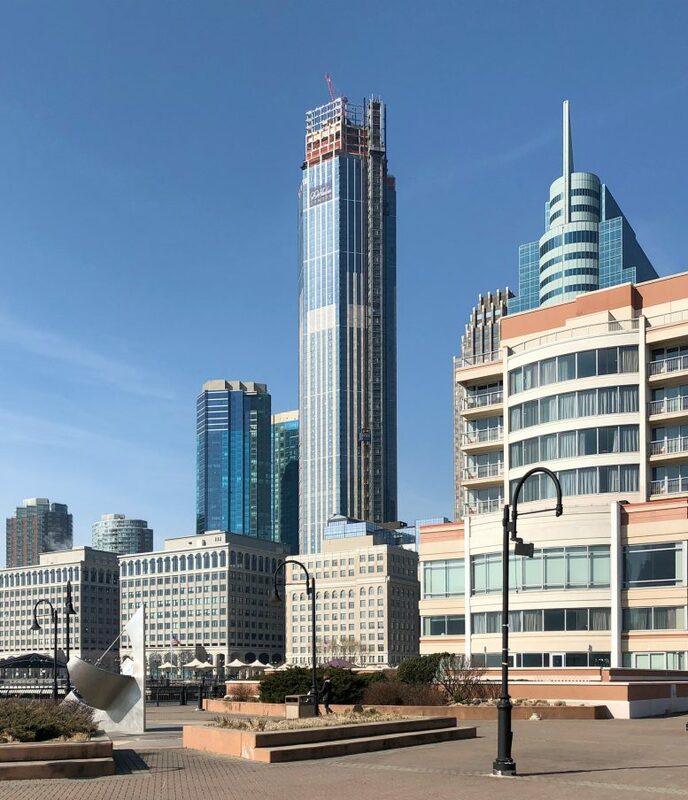 The 79-story residential skyscraper, 99 Hudson Street, is being designed by Perkins Eastman and developed by China Overseas America. 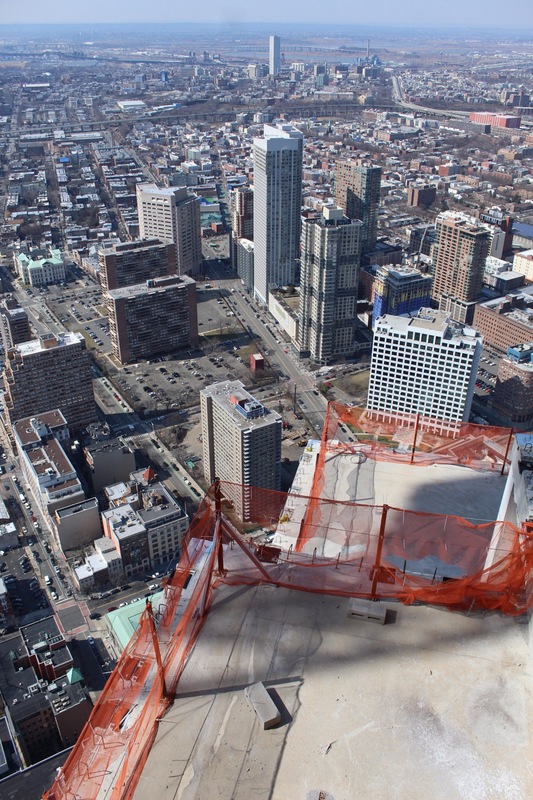 Plaza Construction is in charge of building what is already the tallest tower in Jersey City and New Jersey. 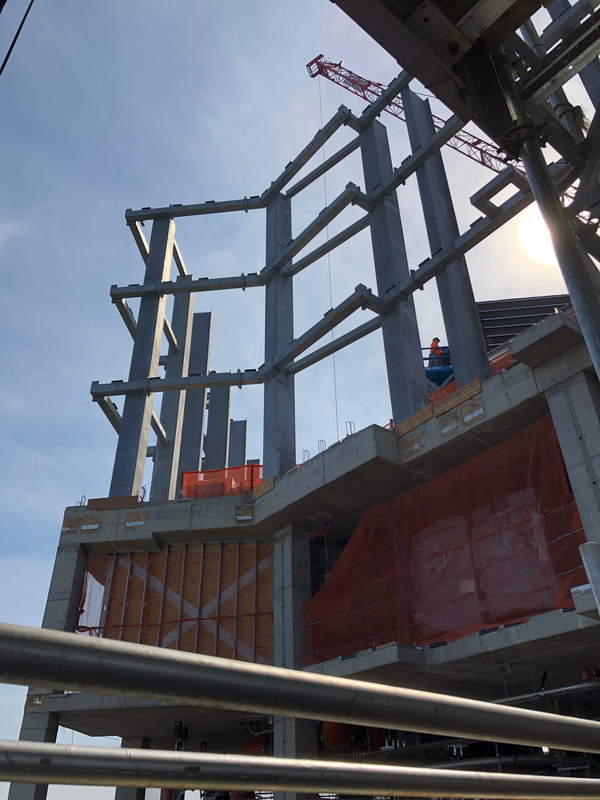 The 900-foot-tall reinforced concrete structure will include 781 units, some with private outdoor balconies and terraces that have uninterrupted views of Lower Manhattan and Midtown across the Hudson River. Vidaris is responsible for the exterior envelope that consists of a glass and Jura limestone curtain wall. 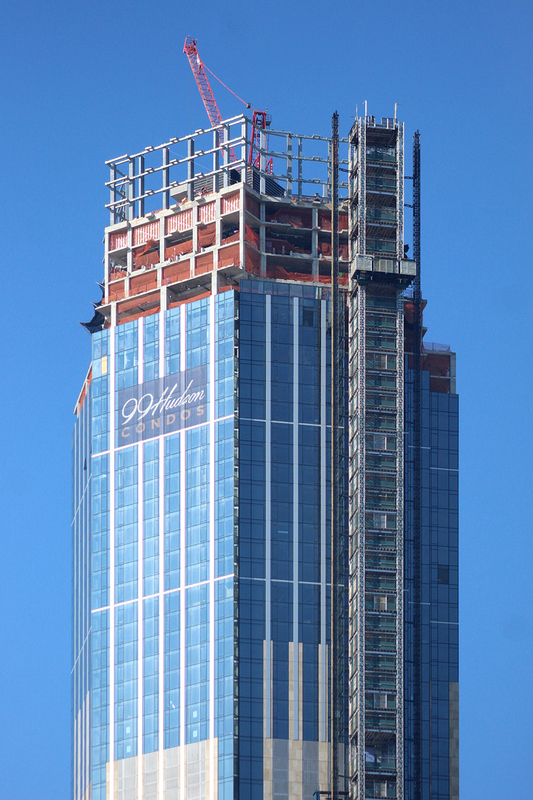 The facade is less than 10 floors away from reaching the crown and upper mechanical floors. YIMBY got to go on a hard hat tour of the 77th floor, just two levels below the top of the project, to check out the views looking east towards Manhattan. Most of the outdoor terraces will be on the upper floors of the building where the penthouse units will be located. Prices for these condominiums have not been announced yet. 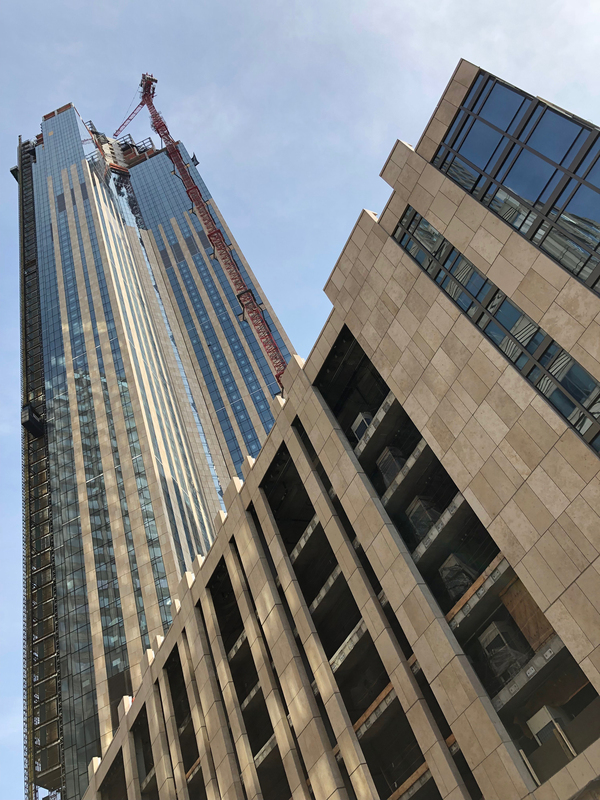 99 Hudson Street is expected to be completed by the end of the year. 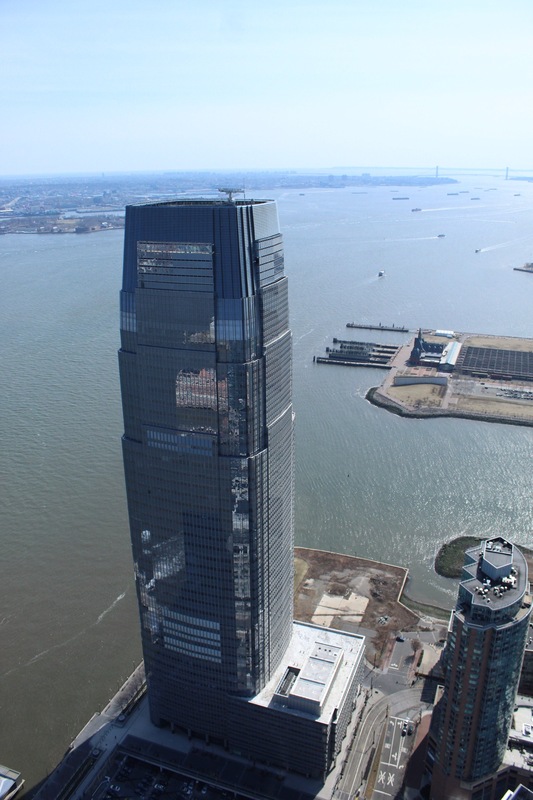 11 Comments on "YIMBY Tours 99 Hudson Street, New Jersey’s Tallest Skyscraper"
Majestic tower in booming Jersey City skyline, the best “a million dollar view” on Manhattan Skyline on East Coast!!! New Jersey Gold East Coast!!! The views are beautiful but the architectural design of the building is beyond hideous. I should know as I work near the building site and pass by it often during the week. 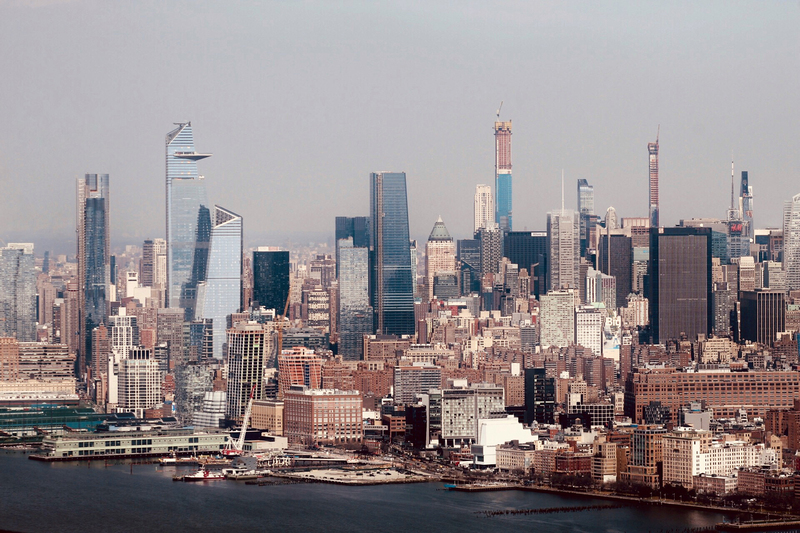 I am not sure what they’re teaching in architectural design programs and schools today but all of these “modern” buildings that have been going up recently (ahem…Hudson Yards) including 99 Hudson are more of an eyesore than anything else in the skyline compared to buildings built in the past. Just my two cents. retail garage podium covered with glass and stone as rest of building. And architectural height of 900 feet, unfortunately it’s FAA restriction, applied to whole state of NJ, planes who are approaching to NYC/NJ 3 airports are start descending as far as from Atlantic City, plus Liberty International Airport is less than 8 miles away. So max height of buildungs is limited to 879′. Anything above it slightly required FAA permission. They gave them permit to not exceed 900′, a just mere few meters above limit, to accommodate building bulkhead. Official height of this building is 879′ to rooftop, 900′ with bulkhead. They want to built it 950′ to rooftop originally. And NJ worst designed building is URBY. 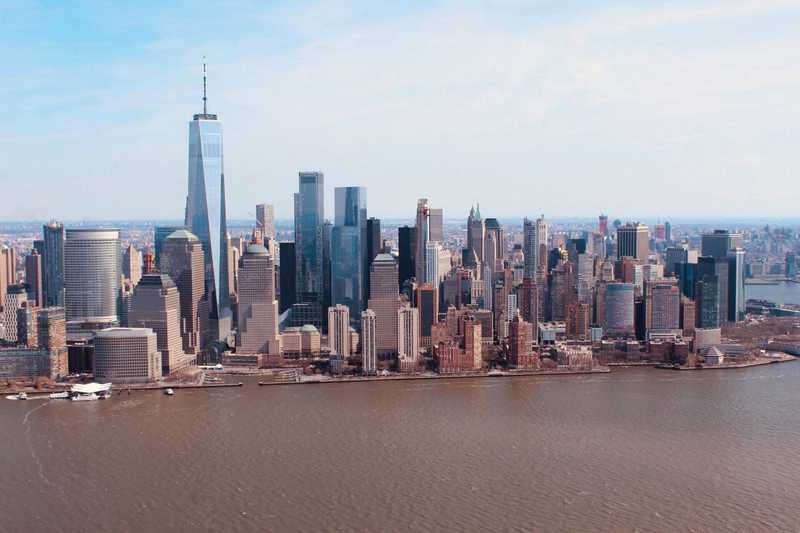 This destroy skyline, best designed is a “Prism” in Newport neighborhood, 42 story Lefpak waterfront development of 445′. If anything is a hideous eyesore, it is all those ridiculous pencil thin super talls in Midtown Manhattan. Those skyscrapers should have never been permitted in the first place. 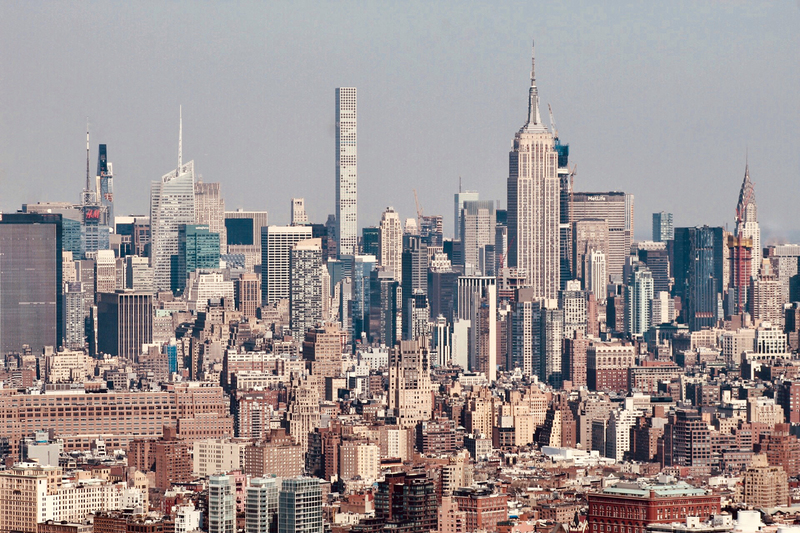 The historic Empire State Building should be kept the tallest in Midtown Manhattan forever. No legitimate need to build higher than the Empire State except to inflate some greedy developers ego. Time to jack up taxes by 80% on the wealthy. 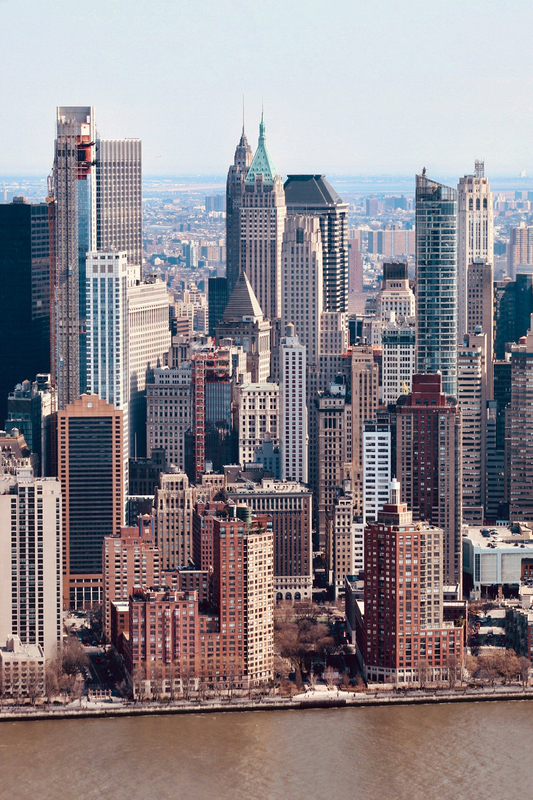 NYC skyline is so big, long and thick, that you hardly destroy it just by placing there a few mediocre designed buildings. And 57th Corridor needs this “pencil thin” supertall towers of 1005′-1550′, as well as new business district in Hudson Yards. Do you know what this place was resemble just back to 2010??? 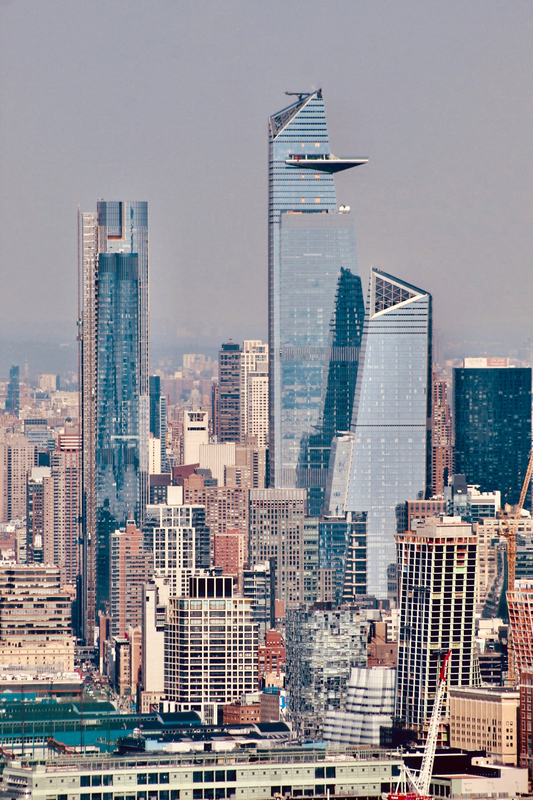 Before Hudson Yards construction started, do you know what crappy rundown “buildings” were in place of One57, Central Park Tower and Steinway Tower, or empty parking lot for over decade in place of 53West53, or other “thin pencils”???? Thanks God that Recession was over in 2011 and NYC entered in one of longest construction boom. Btw affected Jersey City construction boom too!!! Without these “greedy developers” you have second South Bronx here instead of World class skyline in New Jersey!!! Please stick out of your political views or opinion from here. Without these rich people we would have slum building here instead of Real Skyline in NJ Gold Coast!!! Maybe taxes should increase by floor, so whoever lives on the uppermost floors of these super falls pays more. This would be a kind of reparation for the negative local impact of these massively tall towers (I.e. increased shadows cast at street level, increased crowding, impact on infrastructure like transit, etc.). I should whip off an email to AOC’s suggestion box! This is the reason I left NJ. The wealthy will be the only ones to afford to live there. I moved and bought a brand new Townhouse in Virgina. NJ is a big mess. I have to say, those comments from Robert re. skinny towers have to be the worst comments I’ve read on NYYimby. Beyond absurd. Yeah, NYC needs to kick out all the taxpayers and stop building anything. Sounds like a plan. Developers are not saviors. They collude, hoard real estate,create a fake housing crisis to jack up prices plus dont pay taxes. If there was really a housing crisis why are all these buildings offering a ton of concessions and free months of rent while sitting half empty? Look at the Brooklyn Point condo development. It will sell out at 900 million but has a 25 year tax abatement.They and anyone who buys the million plus dollar condos will pay ZERO TAXES! Take a look at how many of these luxury housing and condos dont pay taxes. These large developments dont even house jobs and a lot sit empty without residents acting more like banks for foreign rich buyers than residences. Construction workers who build them dont even live in NY. Where is the benefit for the city?